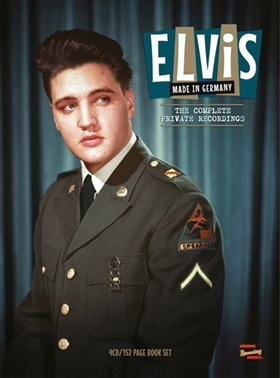 The MRS label released ‘Made in Germany – Private Recordings’ which features the best of the remastered private recordings Elvis made in Germany, for Record Store Day 2019. Limited Edition 180-gram 2LP set with a 24-page photo spread gatefold with stunning pictures. (ie the Elvis SUN 78rpm replicas being pure vinyl aural delight to me). At one point I owned Elvis’ Golden Celebration RCA Vinyl set which featured six albums with two sides dedicated to Elvis’ home recordings - one including five tracks now featured here an amazing 35 years later on this MRS release. Sadly the best of my vinyl collection was stolen while I was overseas years ago including that RCA box-set. The two albums are divided into Guitar Reel for the first two sides and then Piano Reel for the last album. AUDIO QUALITY: Of course being Home Recordings these cannot be compared to the other MRS release of Movies Masters. However the quality is still very impressive compared to earlier outings – hard to believe these are the same tape source as those 1984 RCA vinyl releases. 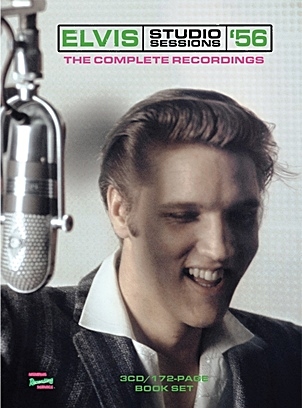 It’s quite astounding when one realises that you are listening to Elvis singing at home recorded purely for personal enjoyment – two sides of this set that were only discovered last year – and here you are eavesdropping on such magic moments via beautiful 180gram vinyl. Again with Studio Ds remasters some tracks are outstanding even if they were only home recorded! 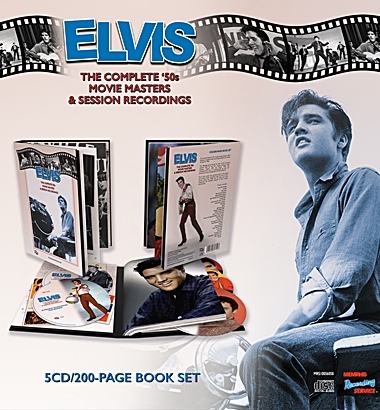 The pages feature plenty of text from Gordon Minto (Elvis The Man and His Music) which helps explain the importance of these historical home recordings. And while the text is the same as featured in the recent MRS Book/CD combo (see full MRS book review here) the real surprise is that there are plenty of images included in the 24 page photo-book that were not used in the MRS ‘Private Recordings’ book. The photos capture Elvis both On-Duty and Off-Duty and some full-page images are in great quality. There were several photos here that I am sure I have never seen before. This makes this set even more of a collector’s treat. Being “album size” this photo-book features some truly amazing photos of Elvis in a stunning format. Compared to a regular CD, or even FTD’s “Classic Album” 45rpm size, these pages truly impress. Comparing the vinyl photo book to MRS's previous Elvis 'Off-Duty' package. Kicking off with ‘I’m Beginning to Forget You’ and Elvis saying “Don’t come back in here if you hear me singing, Lamar!” the albums are a delightful ‘Best of’ selected from MRS’s recent The Complete Private Recordings with each side running around a packed 24 minutes. 'I'll Take You Home Again Kathleen', 'It’s Been So Long Darling', 'The Titles Will Tell', 'Send Me Some Lovin'' and 'The Fool'. On a positive note collectors will be delighted that there is 30 minutes featured from the newly discovered home-recordings tape. Treasure hunter Juan Luis Gonzalez is specially thanked in the sleeve notes. Nice two-page display of how Elvis' army studio portraits would be used on future RCA releases. My only complaint is that on the final side we get the full 7 minutes of ‘Send Me Some Lovin'’ including its rather distorted last half but only two minutes of the beautiful sounding ‘The Fool’ to end with. 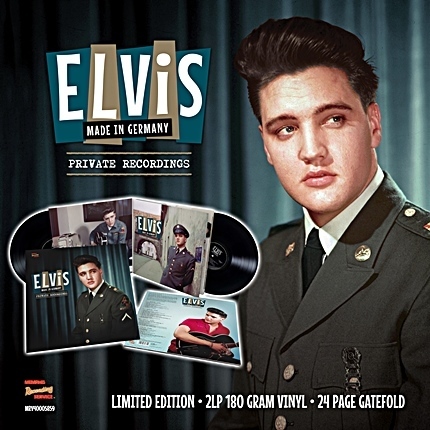 Overall Verdict: While I expected good things for both these MRS 2019 Record Store Day releases I was again stunned by the overall presentation of Elvis' German Private Recordings. After spinning the MRS 'Complete Private Recordings' CDs in recent weeks I was surprised how much I enjoyed listening to the "Best Of" one more time - but this time from Vinyl. The massive size 24-page photo-album with accompanying text and rare photos again makes this MRS release a true collectable.